You can enter below via the online entry forms, plus download Class Rules and Guidance, Scoring Criteria and specimen Marking Sheets. You can also enter at the show, up to 12pm (midday) on the Saturday however, and without exception, entries will not be accepted after this time. Standard Triumph Marque Day owners that wish to enter a car into the Concours, PofO or Survivors are to ensure their car is entered in advance on-line or on the day and in place by 12pm (midday) on Saturday 30 June. If you have entered in advance via the TR Register on-line entry form please register at the Epic Centre East Hall as soon as possible on the Saturday as this will take a little time. The Concours Hall will be open on Friday 3pm to 6pm, Saturday between 9am and 6pm and Sunday 9am to 4 pm. Due to limited space in the hall, once Concours entries are positioned movement of cars will be limited until the awards presentation on Sunday. Cars will be secured in the East Hall overnight on Friday and Saturday. Judging will take place between 3pm and 6pm on Saturday. 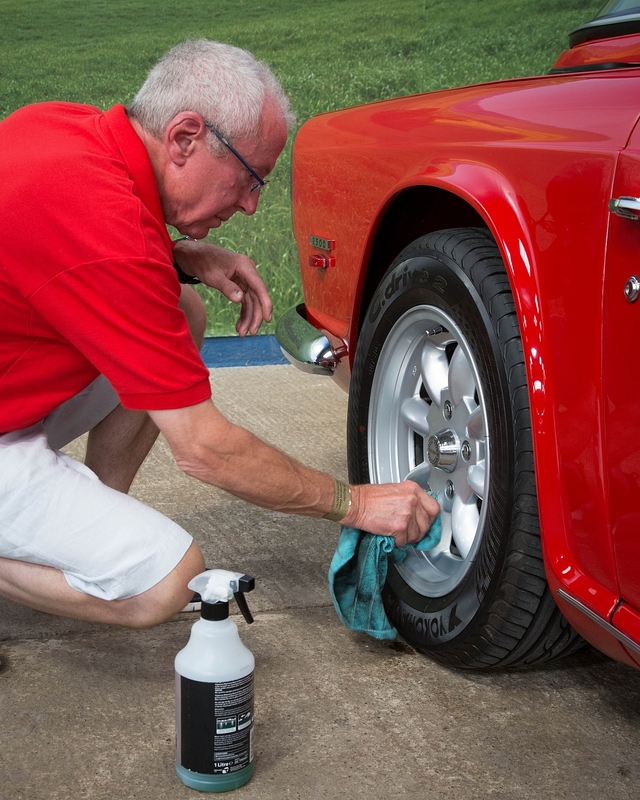 Judging may last up to 30 minutes and hoods, Surrey tops and sidescreens are to be erected/fitted and the spare wheel is to be removed before judging. You may be asked to stow the hood/Surrey section or remove the sidescreens during judging. The awards presentation will take place on the grassed outside area to the rear of the Epic Centrefrom 2pm on Sunday (with a wet weather contingency in place); this will allow greater participation by members, the public and celebration of award winners. Class winners from the preceding year(s) and the very best Concours D'Elegance cars the TR Register has to offer. Cars will be judged on cleanliness and condition only, with no penalties for non-standard components, fittings, finishes, modifications or modern equipment. All switches and lights will be tested for working order. Engines will not be started. Cars will be judged on cleanliness and condition of all components, finishes, fittings and accessories to factory finished condition (original or replicated). All switches and lights will be tested for working order. Engines will not be started. Points will be deducted for non-standard fitting, finishes, components and accessories. Cars will be judged on cleanliness and condition only, with no penalties for non-standard components, fittings, finishes, modifications or modern equipment. All switches and lights will be tested for working order. Engines will not be started. Is open to good clean TRs that are used regularly and are not concours standard. Entrants with cars the organiser considers are in Concours condition or freshly rebuilt will be encouraged to enter the Concours Class. Marks will be awarded for presentation, cleanliness, points of interest, and proven mileage. Judging will be topside only (including interiors) - bonnets and boots remain closed. So what is a Triumph 'survivor'? A survivor is a car which is substantially original and unrestored from when it left the factory (e.g. original panels, paint, interior, engine etc) and the display will give members and the public an opportunity to see close-up Triumphs and derivatives that have survived the ravages of time and have avoided restoration, some for over 50 years! Why are there so few Triumph 'survivors' around? Our cars started rusting from the day they drove off out of the showroom; some even started rusting before they left the factory! Many original unrestored Triumphs have been restored over the years and original cars made the perfect basis for a restoration in an endless pursuit of cosmetic perfection. However, times have changed and like classic works of art or antique furniture original unrestored cars are now being appreciated for the place in motoring history they occupy. Whilst cars are not being formally judged and you are not competing with other owners, cars are being considered for an award against original factory standards i.e. the annual 'Triumph Survivor Cup' for the survivor considered the best of the display and two runners up will receive an award. So, if you own a Triumph or a derivative 'Survivor' and would like to be part of the Standard Triumph Survivor display at Lincoln then please enter online via the TR Register 2018 Concours Webpage or contact Andrew Smith for a Car Information Sheet: email TriumphSurvivor@gmail.com. Marking sheets - use these as guidance on how the judges will assess your entry.